Open M-F: 1 p.m. – 4 p.m. Sat: 10 a.m. – 12 p.m. & 1 p.m. – 4 p.m.
Ball field, trails, grills, tables, restrooms, fishing, playground equipment. The 18-hole "Island Pine" course at the Island Pine Country Golf Course features 6,786 yards of golf from the longest tees for a par of 72 . The course rating is 72.4 and it has a slope rating of 130. 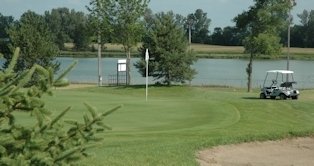 Designed by Darrin Kragenbring, the Island Pine Golf Course opened in 1995. Josh Hagstrom manages the course as the General Manager. Grills, shelter, tables, restrooms, swimming, fishing, recreation equipment.